#BSPC is back! For the launch of our website we have teamed up with Nike, yes the empire built by Phil Knight, and Expressions to celebrate The 12 Days of Nike. Participate in the Instagram photo challenge by posting atleast 1 picture a day following the daily inspiration by each day on the flyer. 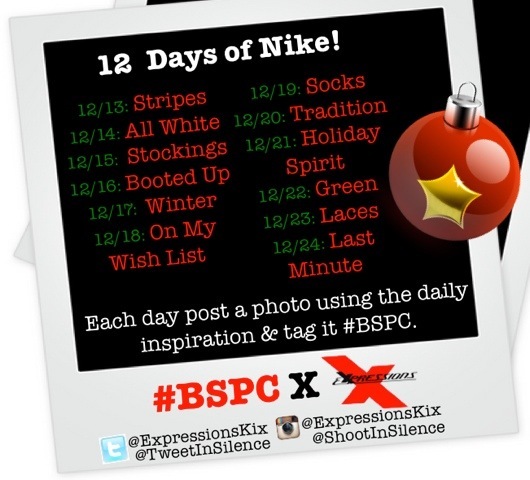 Make sure with each post you hash tag #BSPC. At the end of the 12 Days of Nike we will be giving away a pair of Nike Woodside boots to someone who participated in all 12 Days.